a boxlike storage compartment without made to slide horizontally in and out of a desk, chest, or other piece of furniture. After reading the definitions of junk + drawer, I have decided a junk drawer is not anything I would want to have in my home. And who would? I think we all just want stuff in our homes that are useful and of value. I personally don’t have a junk drawer in my home. But my husband does for sure. I think he may have several actually. Thankfully they are in his spaces. Like in the garage and office, places I rarely go. Here is a photo of my “junk”drawer. Junk Drawer or Utility Drawer? The microwave is above this drawer so it also holds microwave plates, plate covers, hot mats and trivets, as well as “junk”. These are the other things you will find in my “junk” drawer. I guess that wasn’t too bad. Only a couple of things. How do I determine what lives in my “junk drawer”? I only put things in it that myself or my family needs immediate access to and are utilitarian in nature. 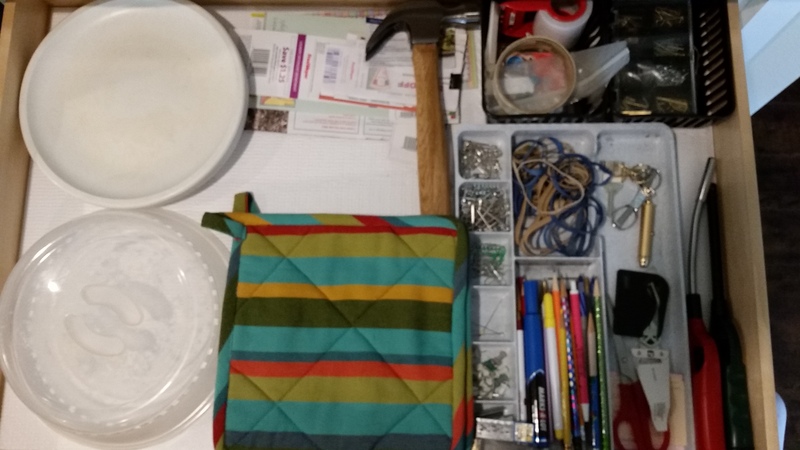 The hammer is there because I don’t want to have to look in the garage for one. It is kind of hard to walk around where the tools are. Scissors, tape and rubber bands, pens and pencils. Everyone needs those. It also keeps others out of my office drawers, which ensures my things will be there when I need them. I know that it is not a temporary place to hold all things. A place for everything and everything in its place. I will give you permission to have a small container in the drawer that is a temporary holder and is cleaned out regularly. That means when it’s full, find a place for everything in it or get rid of it. I have an idea. How about we think of it as a Utility Drawer rather than a Junk Drawer. It might make a difference in what lands there!